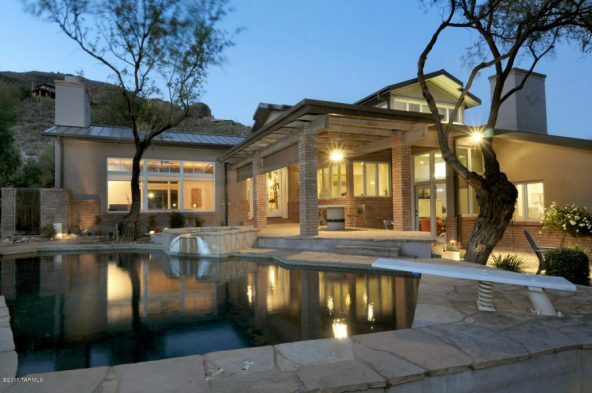 This stunning, architect-designed, contemporary home situated between the lake at the prestigious Loews Ventana Canyon and the mountains is the perfect luxury home for the golfing enthusiast. The front courtyard exhibits a sparkling fountain surrounded by lush green grass all with a breathtaking view of the mountains. The extravagant eight-foot doors give this home the air of class, while the vaulted ceilings open up the home and make it inviting. Large windows throughout provide plenty of natural lighting, and you will love the gourmet kitchen complete with granite counter tops and stainless steel appliances seamlessly flowing into the gorgeous wood cabinets. The master bedroom is spacious and comes complete with a sitting room with its own fireplace and a luxurious walk-in closet. The private, flagstone patio with city views is the finishing touch to this majestic home.